Let us consider a binary solution of two volatile liquids with two components 1 and 2. When taken in a closed vessel, both the components would evaporate and eventually and equilibrium would be reached between vapor phase and liquid phase. At this stage, let us assume the total vapor pressure is ptotal and p1 and p2 are partial vapor pressures of the two components 1 and 2. These partial pressures are related to mole fractions x1 and x2 of the two components in that order. Roult Law: For a solution of volatile liquids, the partial vapor pressure of each component of the solution is directly proportional to its mole fraction present in the solution. Here, `p_1^0` is the vapor pressure of pure component 1 at the same temperature. According to Dalton’s Law of Partial Pressures, the total pressure (ptotal) over the solution phase in the container will be the sum of partial pressures of the components of the solution. Total vapor pressure over the solution can be related to the mole fraction of any one component. Total vapor pressure over the solution varies linearly with the mole fraction of component 2. Depending on the vapor pressures of pure components, total vapor pressure decreases or increases with the increase of mole fraction of component 1. 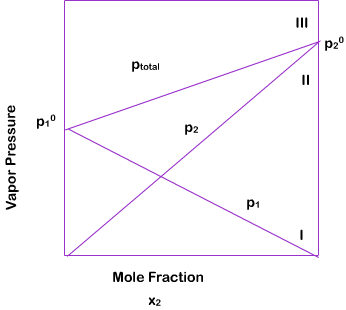 A graph of p1 or p2 versus mole fractions x1 and x2 gives a linear plot. The lines I and II pass through the points for which x1 and x2 are equal to unity. The minimum value of ptotal is p10 and the maximum value is p20. Example: Vapor pressure of chloroform (CHCl3) and dichloromethane (CH2Cl2) at 298 K are 200 mm Hg and 415 mm Hg respectively. (i) Calculate the vapor pressure of the solution prepared by mixing 25.5 g of CHCl3 and 40 g of CH2Cl2 at 298 K and (ii) mole fractions of each component in vapor phase. In both the equations, partial pressure of the volatile component is directly proportional to its mole fraction in solution. Thus, Rault’s law becomes a special case of Henry’s law in which KH becomes p10.